Ignore whatever grudge you’ve been holding onto since high school: Geometry is back in a big (and, for those of us less mathematically inclined, hopefully, less traumatic) way. This time, it’s coming for your tables. A recent Pinterest report found that searches for geometric accent tables had increased 526 percent since last year, and if you’re one of the many people intrigued by this cool and contemporary style, we have you covered. 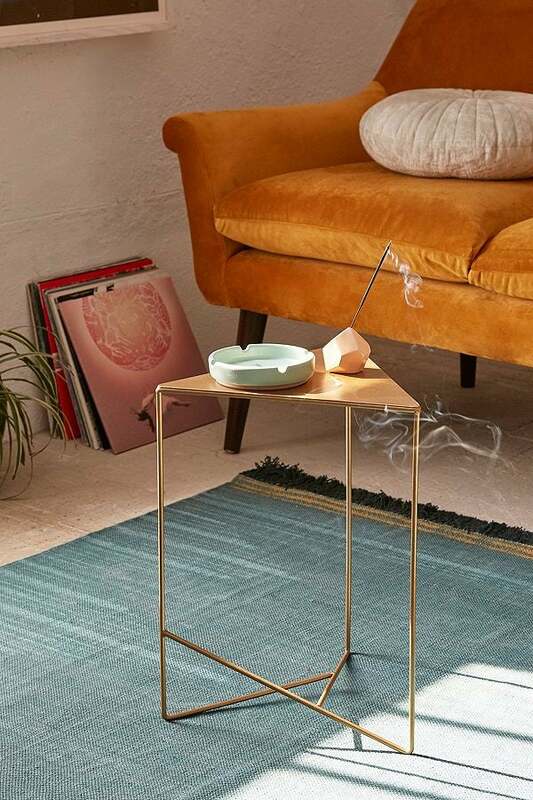 Whether you’re looking to splurge on an investment piece or just pick up a quick seasonal update, here are the best geometric side tables on the market right now. For something a bit more colorful, try this cool glass option. It was designed by Sebastian Scherer to create an optical illusion—depending on what angle you view it from, a perfect cube forms. Visual tricks aside, it’s also just a really beautifully crafted piece. Tiny and oh-so-affordable, there’s really no reason not to pick up one of these cute tables for an easy living room update. If you’re not too sure about incorporating metallics, this is a great way to dip your toe into that trend, too. If you’re looking for something on the investment side of furniture, consider this gorgeous marble table. It’s definitely pricier, but the high-end materials and luxe look make it well worth the splurge. Inspired by the lines of paper origami, this table’s unique shape makes an instant statement in any room of the house. It’s uber sleek, embodying Scandinavian simplicity to a T.
Minimalist and modern, this steel accent table is great for both indoor and outdoor use. Once patio season hits, you’ll definitely appreciate the extra surface space for your next al fresco get-together. The timeless brass look of this piece balances out the funkier shape to make for a furniture item that you’ll want to hold onto for years to come. The slightly irregular shape of each of these geometric items is what makes them so special—they almost look like sculptural art installations, but they’re perfectly functional as well. The white and light natural wood combo is a classic one for a reason; it goes with all pre-existing style aesthetics and is instantly reminiscent of summer. Which is always a plus, right?